The last food price spike, which peaked in 2008, was a play in two acts. During Act One – until mid to late-2007 or thereabouts – rising prices were largely driven by supply and demand fundamentals: factors like crops being diverted to biofuels, low stock levels, poor harvests in some regions, that kind of thing. Over the last two weeks, developing nations have put in orders for unusually high amounts of staples, mostly wheat and rice, or announced plans to build stocks. Governments are reacting to growing social unrest about rising domestic prices. The result: international agricultural commodities prices are already rising fast just as the market suddenly faces a step increase in demand. In Chicago, soft wheat prices have risen to a fresh 29-month high at $8.60 a bushel. The cost of premium hard wheat, used to bake bread, is rapidly approaching the key $10 a bushel level in Kansas and Minneapolis. Rice prices have also moved higher to nearly $550 a tonne, although the cost of the Asian staple is rising from a lower level and is still far below the record of 2008. The accelerated buying is coming from a broader spectrum of developing nations. Algeria bought 800,000 tonnes of wheat on Wednesday, bringing the total since the start of the year to a hefty 1.7m tonnes. Although the North African country is one of the world’s biggest wheat importers, buying about 5.0m-5.5m tonnes a year, its purchases so far in 2011 appear well ahead of normal patterns. And Saudi Arabia has said it plans to double the size of its wheat stocks to cover the demand of a year. Bangladesh, one of the world’s largest rice importers, on Thursday raised its import target for the grain to 1.2m tonnes, up from an initial estimate of 600,000 tonnes. Badrul Hasan, director for procurement at the nation’s Directorate General of Food, told Bloomberg News the reason was “panic buying” among the country’s population. 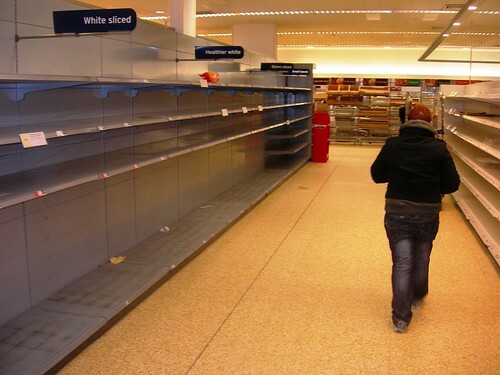 As government step-up their purchases, the shortage of supplies is going to become more evident, and is likely push prices even higher, leading to outright panic buying, as in 2007-08. As such, traders and investors looking for rising prices denting demand should be careful: governments will pay almost any price to secure wheat and rice if they feel social unrest is looming because of rising domestic food prices.